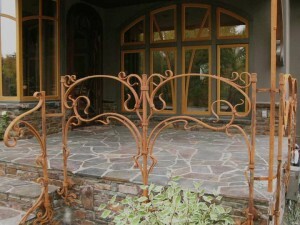 20 feet of Art Nouveau style railing with a rust and linseed oil finish. 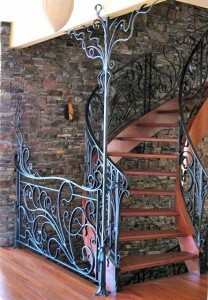 This Art Nouveau inspired railing totalled 150 feet, with 3 double-sided 180 degree curved staircases and landings. 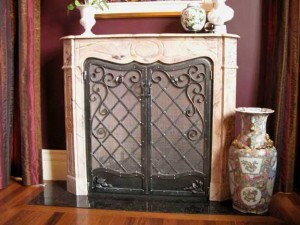 It has a tinted linseed oil and wax finish. 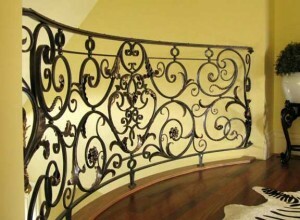 A traditional French style balcony railing with a multitude of custom created leaves and rosettes, all hand painted in a bronze finish.